Welcome to Marvel Strike Force Heroes page. This is the full description of MSF Loki stats, skills and abilities. Loki is the Asgardian Controller who use his cunning magic to expose enemy vulnerabilities and clone himself. His first ability inflicts heavy damage and provides Loki with a 30% chance to gain Evade. His second skill is very tricky – it applies Defense Down to primary target for 2 turns and forces 2 random enemies to strike primary target for 30% of their base damage applying their debuffs in the process. For example, if you hit Drax who has taunt with Loki second ability while Yondu is also in the enemy team, Yondu will (if mind controlled) remove taunt from Drax. Very nice and very crafty, isn’t it? Loki ultimate summons 2 mirror images of Loki at 300% of his base damage and provides Loki with Stealth and Evade. Additionally, Loki passive ability reduces enemy resistances by -30%. Loki could be a very useful hero in properly assembled teams and he shouldn’t be considered lightly. His price is 45 shards obtainable only through Mega Orbs, Premium Orbs, and 3-6 Mystic Campaign mission. Gain Stealth. Summon 1 Mirror Image at 100% normal damage and 100% of normal health. Mirror Image has a 50% chance to gain Evade. On Spawn, gain 100% Speed Bar. MYSTIC CONTROLLER allies gain 50% Speed Bar. 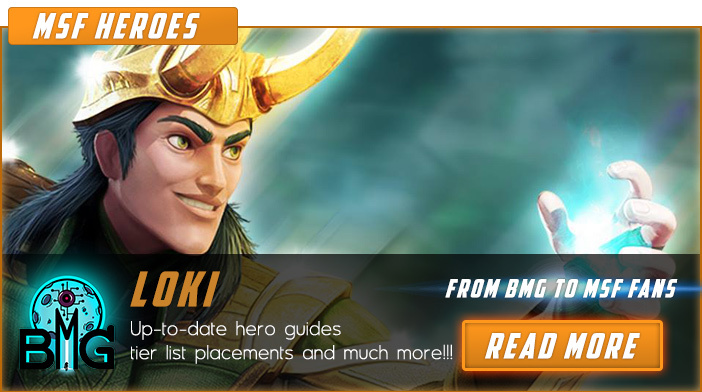 We hope that you enjoyed the description of MSF Hero Loki. For detailed information about other MSF Characters check our MSF Heroes page.